Steak and chips. I'd love steak and chips. I like steak medium to well done. Can't have blood coming out of it. I'd feel like a vampire or cannibal. And proper chips. Not the frozen or oven ones that taste like soggy cardboard. No, proper, sliced from the spud, fried CHIPS. Of course, if you're on a certain side of the Atlantic, that's crisps you're thinking of. Or thick fries. What do you call them? The weightier siblings or the French Fry? I remember, when I was younger and just being introduced to the fast food fury, that I thought it was kinda cool and sorta sad that our nation's favourite food was being called something else. Hey! It's American! Fries! How cool! Hey! It's American! No way can they change the name! So I'd alternate by wanting to call them all fries, even when it came with batter coated haddock, to refusing to refer to them as anything other than CHIPS! But, I'm from Grimsby. The home of fish'n'chips. It verged on heresy to a child who'd been weaned on deep fried everything. Anywho-be-do. Steak and chips. Or bacon. 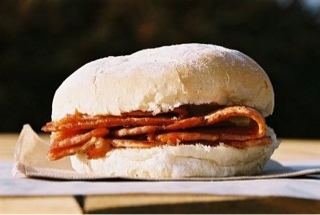 A well done bacon and egg butty. Bread bun, sliced open, a better-bit-o'-butter, and some bacon and a fried egg. Where I used to work, with a certain furnace I'm planning on becoming very intimate with, Friday was Butty Day. As it was situated in an industrial area, there was a mobile kitchen that would deliver for free if your order came to more than £10. As such, with various requests for my own delight or sausage and mushroom and more, they'd drop them off at the entry turnstile at 10am. Washed down with a nice cuppa, it was the perfect way to welcome in the weekend. I miss that. They wouldn't, methinks, fancy delivering to an asylum. All those crazy people. Then there's the actual residents. If it had occurred to the orderlies, however, and if a similar franchise operated nearby, they'd take great pleasure in hungrily devouring such delicacies right in our faces. Taunting with moans and yums and dribbling chins. I don't think I'll mention it. Saying that, my stomach is threatening to tell them itself. It's started to grumble and groan. Like a distant thunder, its rumbling could well create a storm if anyone tried to force the reason for my stomach's verbosity. I'll have to think of something else. Football. Like 'proper' chips, I mean 'proper' football. The sort played with, no less, the foot. Soccer, if you must. Again, like fish'n'chips, it was invented by this fair country of mine. Thing is, we're pretty good at fish'n'chips. Bet you would've it washed down with a pint! My husband Larry and I watch "Keeping Up Appearances," a British sitcom that has a character, Onslo (not sure of the spelling). Onslo loves bacon butties and spends a lot of his time drooling and bemoaning the fact that he does not have one. I spent an entire day on the Internet trying to find out what the heck that was because Larry just had to have one. I think he aspires to being much like Onslo. What I came up with from the Internet looked nothing like that yummy-looking thing shown on your post, Alison. What's Two Days Between Friends...?